''AS IS'' Very well maintained condominium. 2 Bedrooms and 2 Bath in the second floor. Livingroom/Dining room combo make for great open area space. New fresh paint and carpet flooring. Kitchen equipped with stove - refrigerator - dishwasher and microwave. Washer/Dryer hook up inside and utility storage room. Amenities include community pool. Location is great. 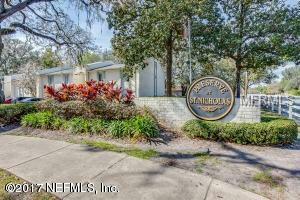 Easy access to I-95, convenient to downtown, Baymeadows, San Jose, San Marco. Close to shopping and dining. Great Investment!! Listing provided courtesy of Keller Williams At The Lakes.